The hypersonic arms race continues towards its destructive finish line at breakneck speed. After both Russia and China declared big successes in their development of faster-than-Mach-five weapons, the U.S. Air Force announced a pair of contracts to develop its own hypersonic vehicle, an article in Live Science stated. The first deal called for the creation of a Hypersonic Conventional Strike Weapon (HCSW). It was worth almost a billion dollars. The more recent one costs around half as much. It is a request to design a weapon called the Air-Launched Rapid Response Weapon (ARRW). Both contracts were awarded to Lockheed Martin, netting the defense contractor a total of $1.4 billion. Regarding these awards, Secretary of the Air Force Heather Wilson remarked that the military intended use the best technology in order to deploy hypersonic weapons as soon as possible. Hypersonic vehicles can travel more than five times the speed of sound (Mach five, or 3,836 miles per hour.) Furthermore, they can maneuver at those blistering speeds, allowing them to dodge attempts to shoot them down. The awards did not reveal much about HCSW or ARRW. Their capabilities can be surmised given what we know of hypersonic weapons. 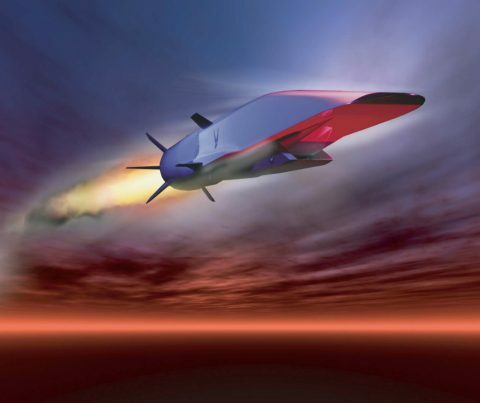 Most examples of hypersonic vehicles are powered by either a ramjet engine or the more powerful scramjet (supersonic combustion ramjet). Both engines function by compressing and combusting air. Scramjets accomplish this with supersonic air. They need to be carried aboard motherships that can fly fast enough to force air into their intakes at the necessary speed. Earlier hypersonic vehicle projects by the United States include the Hypersonic Technology Vehicle Two (HTV-2). This was an unmanned DARPA-designed bomber that performed several test flights. In one such trial, the HTV-20 reached Mach 20 (15345 miles per hour) before it went out of control and crashed. Another American hypersonic weapon, the X-51A, was an unmanned scramjet that used a waverider design. The entire project cost $300 million and ran from 2004 to 2013. It was jointly run by DARP and the U.S. Air Force, both of which believe the technology can still be incorporated into newer design. The U.S. Army tested its own vehicle, the Advanced Hypersonic Weapon. These separate approaches may soon be a thing of the past. Important Pentagon officers and military officials have formally agreed to cooperate when it comes to developing the now-critical hypersonic weapons. The United States has a lot of ground to catch up to in the hypersonic arms race. Russia has claimed that its jet aircraft will be able to deploy hypersonic weapons starting in 2020. Meanwhile, Chinese media reported the successful flight of the Xingkong-2 (“Starry Sky-2”). The hypersonic waverider sustained Mach five speeds or better for close to seven minutes. To learn more about the threat posed by hypersonic vehicles owned by hostile nations, read more articles at NationalSecurity.news.